Discussion in 'Android Devices' started by WoodburyMan, Apr 24, 2012. Anyone notice the lack of DeskClock app? (ie regular plain "clock" app that most Android devices have). I have Alarm, and World Clock for clock apps but the regular clock which I've seen on two other android devices I've owned (both Archos) and seems to be included in CM releases isn't there. There's third party apps like AlarmClock+ and a few others that mimic it and add but I liked the stock clock app on my last device. I found a APK for DeskClock thats for ICS that is part of a CM9 release test and tried to install it, but apparently it already exists on the Galaxy 2 7.0 and it can't replace it. Any idea how to access it or get it working? That is a widget. 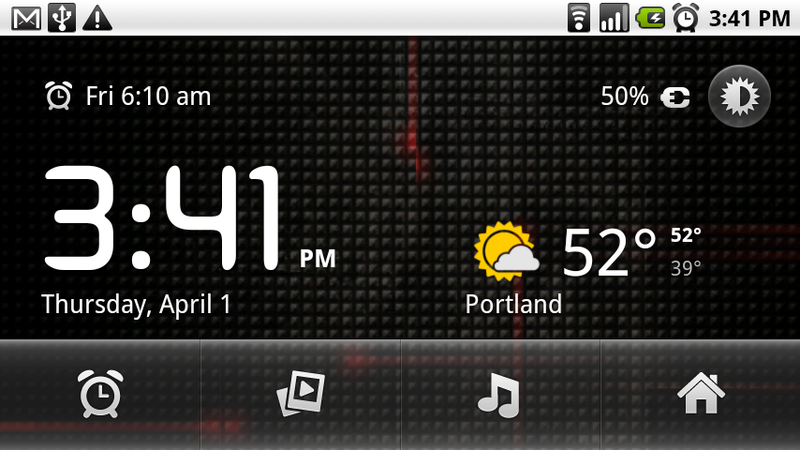 There is a desktop clock widget. Hold press on home screen, select widget, select clock and apply. I have "Analog Clock", "Digital Clock", and "Dual Clock", but none named Deskclock. I'm also looking for a full out App not a Widget. Something that will display the clock fullscreen and has a hardware dim button that works well. AlarmClockPlus and a few others are software and the dock at the bottom remains illumination at full brightness.